Whether you are a new parent or a parent who perhaps needs a little bit of help further down the line, Sweet Dream Babies is dedicated to providing the help and advice that is just right for you. No matter what your circumstances are or your parenting preferences/lifestyle, I will always work alongside you to put the perfect plan in place, for you and your baby/child. I want you to feel comfortable and happy with the methods we choose and be able to work through them at a pace that suits you. And I will always be encouraging you to use your own, wonderful instincts! help your baby/child to sleep independently and peacefully or to co-sleep peacefully. (I do NOT use controlled crying or the ‘cry it out’ method. My techniques are more gentle, and I will not push your baby/child beyond what they are capable of for their age and stage of development). Whether it is help with routines, how to alter your routines as your baby/child develops, feeding, reflux/colic, bottle introduction, weaning, how to communicate with your baby/child, easy, punishment-free discipline techniques…whether it is your first baby/child or your third…whether you are feeling completely overwhelmed or just in need of some extra advice…please do get in contact! Babies thrive and are most content in a predictable environment, with a structured yet flexible approach to their development. 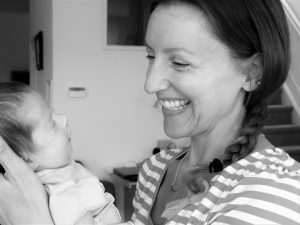 Therefore, one of my main aims is to teach you to gently guide your baby into a manageable routine, using their natural rhythms within this framework. This prepares your baby for sleeping for longer stretches at night as soon as they are able and ensures they feel safe and secure as they slowly get used to life in the outside world! In addition, I teach and guide breast-feeding, expressing, bottle-feeding, new-born physical care, swaddling, how to set up good sleeping habits (I do NOT use controlled crying), how to observe and ‘read’ your baby’s body language, cries and behaviour, how to implement the routines outside of the home and how to build strong foundations from which to progress into the following months. Hopefully there will also be time for a few laughs along the way! Please do visit my Packages Page for packages and costs.